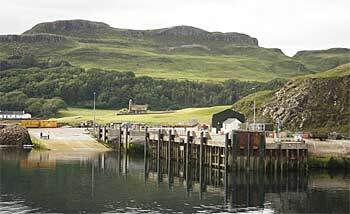 Canna is the most westerly of the Small Isles. It comprises the tidal island of Sanday, now linked by a vehicular bridge and measures 7 km (4.3 miles) long and 1.5 km (0.9 miles) wide. The isolated skerry of Hyskeir lies 10 km southwest of Canna and its lonely lighthouse can be seen flashing from the island at night. 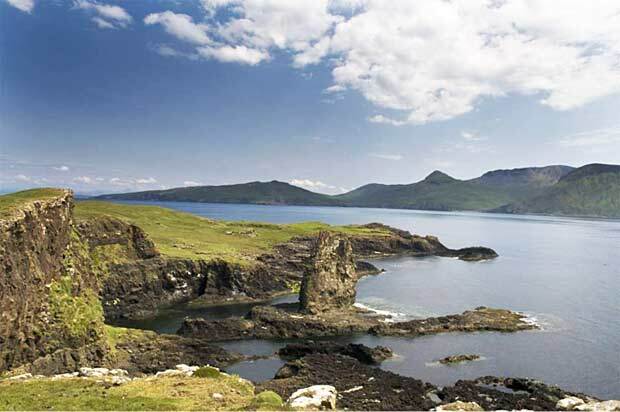 Like Rum, Canna and Sanday form part of the major lava field that extends from northwestern Rum to northern Skye. These basalt lavas were probably erupted from a major volcano on what is now the Isle of Skye, but what makes Canna of particular interest is that the area was traversed by fast-flowing rivers at the same time that the volcano was erupting. Great thicknesses of boulder conglomerate were deposited by this river. The boulders were rounded as they were carried along in the fast flowing river currents. Some are over a metre in diameter, indicating the strengths of the currents involved. Pebbles in these deposits have been matched with bedrock from Skye, suggesting that the river flowed from the north. Impressive, church-organ like basalt pillars are plentiful on the island, standing tall on cliffs above the island’s few houses. A ruinous castle on the east of the island is said to have been used as a prison by a jealous husband who locked his wife here because he suspected her of being unfaithful. On the north of the island, beneath precipitous cliffs is Uaigh Righ Lochlainn (The grave of the King of Norway). A’ Chill, situated to the north west of Canna Harbour, was the main settlement of the island until 1851 when the island was cleared. The post-clearance population is recorded as 57 in 1881 (with a further 62 on Sanday), in which year MacNeil sold to Robert Thom, a ship owner from Glasgow. In 1938 the islands were sold to John Lorne Campbell, who lived there until his death in 1996, although he had gifted the island to the NTS in 1981. His widow, the American musician Margaret Fay Shaw, remained at Canna House until her death in 2004 at the age of 101. Their erstwhile home now houses the couple’s extensive archives and visitors are welcome to browse voluminous photographs, diaries, farm records, correspondence, an impressive entomology collection and of course many Gaelic songs and texts. In May 2012 a farmer unearthed a ‘Cursing Stone’ in an old graveyard. The stone dates from around 800 AD, is about 25 cm in diameter and is inscribed with a cross. It was later found to fit exactly into a large rectangular stone with a worn hole which is located at the base of the Canna cross. The discovery is the first of its kind in Scotland. It is said that pilgrims would recite a prayer whilst turning the top ‘Cursing’ stone clockwise, thereby wearing a depression or hole in the stone underneath. In September 2005 the island was overrun by rats, which had led to a serious decline in the number of breeding seabirds, particularly Manx Shearwaters, of which there had been a significant colony. A rat eradication programme was inaugurated and by the end of 2006 Canna was believed to be rat-free. The number of successfully breeding seabirds, including Puffins has since increased. Sea Eagle is regularly seen on the island and there is a wealth of wild flowers in the summer. Minke Whale and other cetaceans can be seen from the islands’ cliffs. Other attractions for visitors include Gille Brighde, the island’s restaurant and a small craft shop. There is no shop so visitors need to take their own provision across to the island with them. 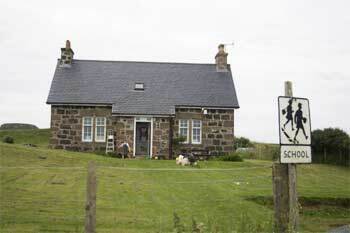 As well as a Guest House, there are several self-catering cottages available for rent and a bunkhouse. A diesel generator provides electricity to the island. In 2001 the visually impressive St Edward’s chapel was converted into a hostel and study centre for the Gaelic language and culture at a cost of £800,000. It was handed over to the Hebridean Trust, but its dream was never realised and the building has since lain empty. Worryingly, there are now only about 10 people living on the island, and the school has had no pupils for over a year. Encouraging news, however, is that newcomers are soon to move to the island and take over the guesthouse. Whether staying for a day or a week, or even longer, Canna is a beautiful island with lots to explore.